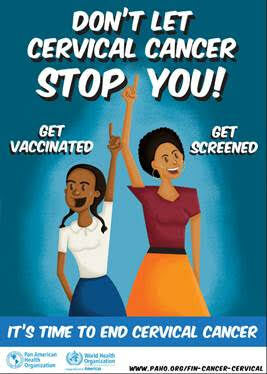 With the slogan, “Don’t let cervical cancer stop you,” the campaign provides materials (poster / video), information and stories about the vaccine against human papilloma virus (HPV), the cause of cervical cancer and about cervical cancer screening methods, to encourage women to have regular examinations for the early detection of precancerous lesions. The ultimate goal is to mobilize health providers, women and girls to seek preventive care and stop cervical cancer from keeping women from reaching their maximum potential in life. The web-based campaign has a section for health professionals that contains guides, fact sheets, answers to frequently asked questions, and a free online course, all aimed at building knowledge of the issue and improving HPV vaccination and cervical cancer screening.